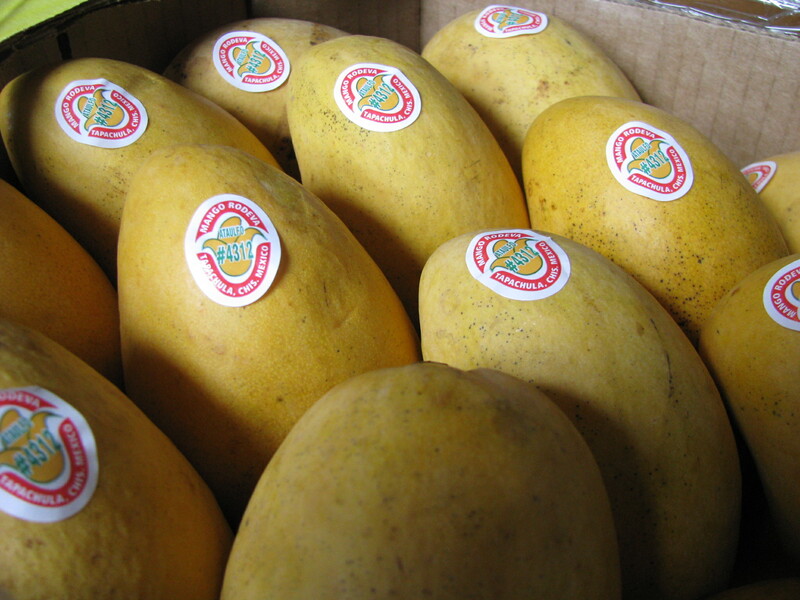 Last time we visited Luc’s Asian Market we couldn’t resist buying a case of mangoes. We wanted to make more mango sorbet after a successful trial run last week. The recipe (from Epicurious) couldn’t be simpler. 3 tablespoons lime juice (or more to taste). The simple syrup, made of equal quantities of sugar and water, should be made ahead so it is cold when you add it to the mango. It will keep for at least a week in the fridge and any leftover syrup is a good excuse to make some cocktails. 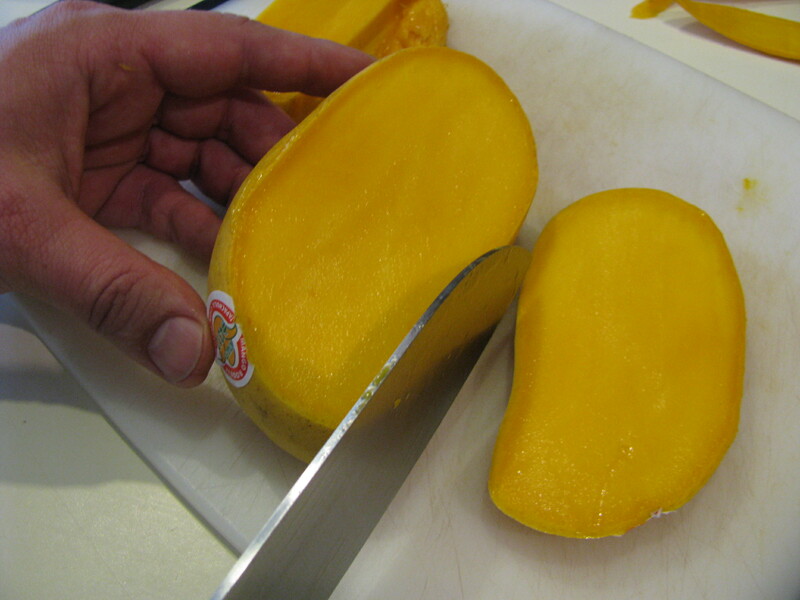 Using a sharp knife divide each mango into three sections by slicing down alongside the pit. Scoop the flesh out of each of the two side pieces using a spoon and put it straight into a food processor or blender. With a smaller knife peel the skin off the pit section by inserting the knife just under the skin and tracing all the way around. Trim any useable flesh from around the pit and add it to the blender. At this point you may not be able to resist gnawing on the pit. That is one of the perks of being the one making the sorbet, but make sure you have dental floss in the house first. That part can be stringy. When you have the flesh of all four mangoes in the food processor or blender add the syrup and lime juice and puree until smooth. Pour the mixture into an ice cream maker and follow the maker’s instructions. I have the ice cream maker attachment for my kitchen aid mixer (a very nice birthday present) and have been very happy with it. The Epicurious recipe uses the mango shells as serving vessels but we stored our sorbet in a tupperware container. 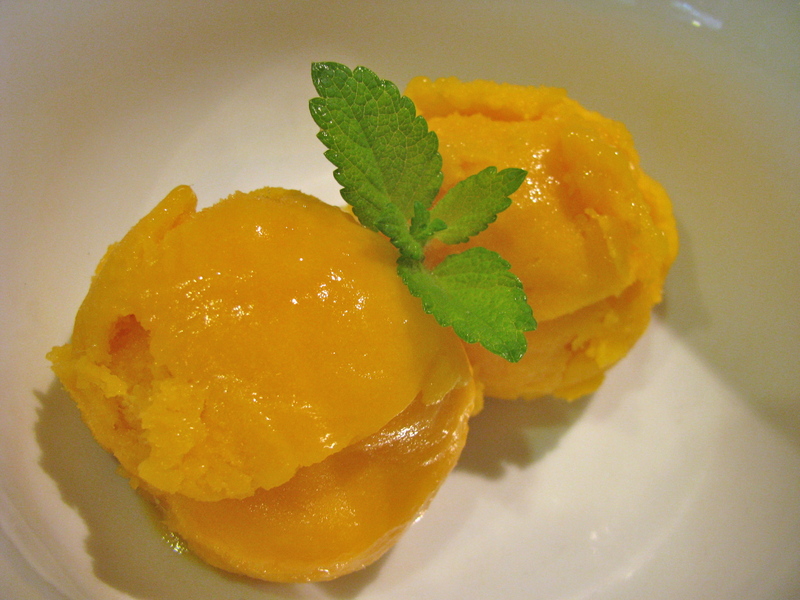 The sorbet freezes very hard so you will definitely want to let it sit out for a while before serving.